Crowds flock to Grand Finals as McDonalds Brisbane Juniors season draws to a close. As the season came to a close, the McDonald’s 2018 AFL Queensland Brisbane Junior’s competition saw 42 teams fight for the seasons premiership titles. The Junior Grand Final Matches rolled out over a three-day format from Friday the 7th to Sunday 9th September. In total, 21 games were played and almost 1,000 players battled it out in hope of taking home the premiership cup. 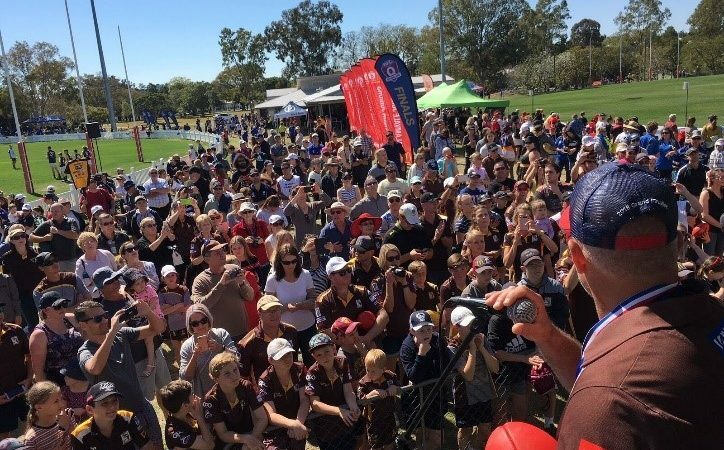 With over 1000 spectators packing out the Leyshon Park fields of Yeronga, the Brisbane football clubs and their fans lined the field boundaries as they supported their local teams. The crowd’s energy was electric, and the stands filled with colour and enthusiasm; encouraging the players to bring their A-game. “It was fantastic to see all our players, officials, supporters and sponsors here to witness the culmination of another successful season,” AFL Queensland State Junior Football Manager Cherie Brockwell told aflq.com. The junior football competition can only come to fruition with the help of volunteers, staff, the players, and the ongoing sponsorship from McDonald’s Bracken Ridge. “We are committed and extremely grateful that we can support the local clubs and have the opportunity to participate in Junior Football,” Mr Rod Chiapello, Owner of Bracken Ridge McDonald’s told aflq.com.au. The ongoing encouragement, participation and support of everyone involved is integral to the ongoing development and sustainability of the junior competition. Chiapello was enthusiastic about McDonald’s continual support of the AFL Brisbane Junior competition. “The executive and the control of the sport, and its administration is first class. It’s exemplary,” Chiapello said. McDonald’s association and sponsorship of Brisbane Junior Football has been continual for many years and will continue to support the competition. The Brisbane Junior’s competition has been nothing short of rewarding for all involved throughout the 2018 season. At the Annual McDonald’s Brisbane Junior Gala Awards Night on August 27th, Ally Anderson, Brisbane Lions AFL Women’s Inside Midfielder discussed the game’s progression and growth during an on-stage Q&A. “With the juniors playing so well and developing their skills so fast, the players will only continue to advance and improve as the game continues to evolve.” Anderson told aflq.com.au. Despite many of the teams feeling disappointed by falling short of the victory, all 2018 teams proved how resilience, mateship and teamwork are still the most important components of the game. All participants of the Brisbane Junior competition should be proud of their efforts throughout the entire season. It has been a notable season as the games were competitive, the players were strong, and the competition had incredible talent. Tigers create history in Townsville.